New York Police Department officers apprehend Stephen Rogata after he scaled Trump Tower with suction cups on Wednesday, August 10, 2016 in New York. Mourners gather at a memorial for stabbing victim Lesandro Guzman-Feliz, 15, in the Bronx. Guzman-Feliz was dragged out of a bodega in the Bronx and hacked to death by machete-wielding Trinitarios gang members. One person was killed by this Citgo gas station pump after a car ran off the road and struck the gas station pumps at Bay St. & Hannah St. in Staten Island, NY. Members of the New York Police Department's Law Enforcement Explorers program console each other following the funeral of stabbing victim Lesandro Guzman-Feliz, 15, at Our Lady of Mt. Carmel Church on Wednesday, June 27, 2018 in the Bronx, N.Y. Guzman-Feliz was a member of the Explorers, an NYPD-sponsored club mainly composed of high school students who receive mentoring and encouragement from cops. Raymond Smith, of Erie, PA, prays before the start of Sunday prayer services at the Mother Emanuel AME Church on Sunday, June 21, 2015 in Charleston, S.C. The church, closed since Dylann Storm Roof killed nine parishioners during a prayer meeting last week, reopened for Sunday services. Detective Joseph Lemm’s 4-year-old son, Ryan, center, salutes as pall bearers carry his father's casket out of St. Patrick's Cathedral following Lemm's funeral on Wednesday, December 30, 2015 in New York, N.Y. Detective Lemm was killed along with five other soldiers by a suicide bomber in Afghanistan. 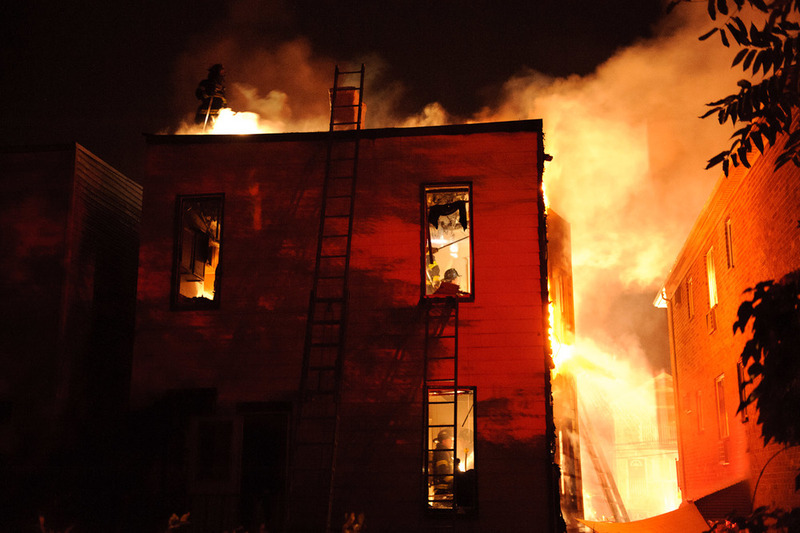 Members of the Fire Department City of New York examine apartments at 2363 Prospect Avenue before removing the bodies of victims of a fatal fire on Thursday, December 28, 2017 in the Bronx, N.Y. Five people perished inside the 25-apartment building, and eight died at two hospitals. People gather at the scene where Imam Maulama Akonjee and his assistant Thara Uddin were killed following funeral services on Monday, August 15, 2016 in Queens, N.Y. A lone gunman executed the revered Queens imam and his friend as the pair walked home. Friends and family members of shooting victim Vlana Roberts release balloons at a memorial outside her apartment on Sunday, June 3, 2018 in the Bronx. 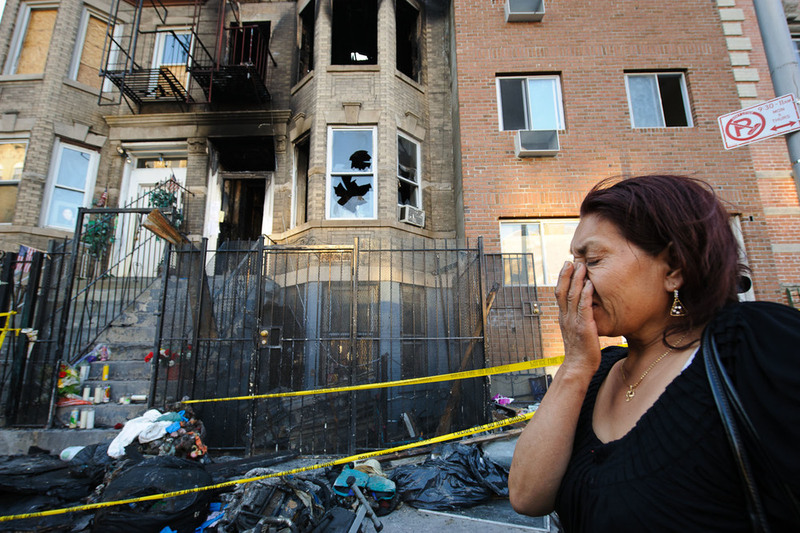 Vlana was shot to death during a large street fight in the Bronx. A man is surrounded by debris from Saturday's bomb blast on Monday, September 19, 2016 in New York. An all-out search was launched by the NYPD and federal law enforcement for the terrorists who set off a bomb on a crowded Manhattan street — and planned to detonate a second one four blocks away. Twenty-nine people were injured in the explosions. Fire Department City of New York Commissioner Daniel Nigro (front, right) joins firefighters as the body of firefighter William Tolley is carried out of Wyckoff Heights Medical Center on April 20, 2017 in Brooklyn, N.Y. Tolley, a 14-year veteran with the FDNY, died after a five-story plunge while working on the roof of a Queens building hit by a small blaze three floors below. Rescue personel remove a man who jumped onto the Amtrak tracks near138th St. & 12th Avenue in Manhattan. The jumper was expected to live. 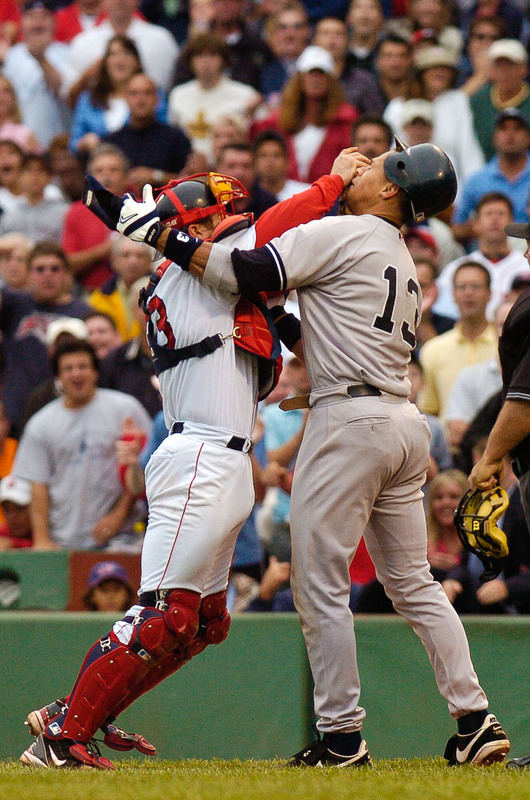 New York Yankees' Alex Rodriguez and Boston Red Sox catcher Jason Varitek fight during a game in Fenway Park on July 24, 2004 in Boston, Mass. Visitors file past the coffin of Rev. Clementa Pinckney, as it lies in state inside the rotunda of the South Carolina Capitol building on Wednesday, June 24, 2015 in Columbia, S.C. Pinckney, a state senator, and eight others were shot to death inside Mother Emanuel AME Church when gunman Dylann Roof opened fire during a Bible study session. German fans celebrate their 1-0 victory over Argentina in the 2014 FIFA World Cup final between Germany during an outdoor viewing near the East River on Sunday, July 13, 2014 in New York, N.Y.
A former police officer and his daughter visit a memorial for New York Police Department officers Rafael Ramos and Wenjian Liu on Monday, Dec. 22, 2014 in Brooklyn, N.Y. The two officers were killed in their patrol car when Ismaaiyl Brinsley shot them to death in Brooklyn. 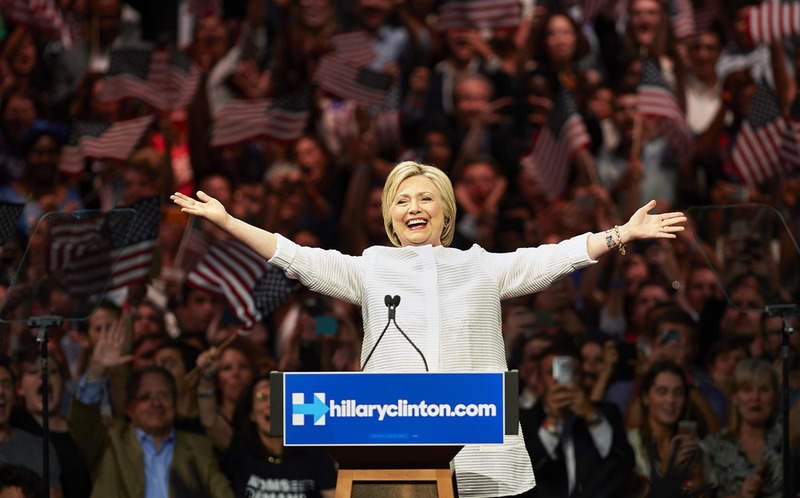 Democratic presidential nominee Hillary Clinton arrives onstage during a primary night rally on Tuesday, June 7, 2016 in Brooklyn, N.Y. Clinton reached the number of delegates needed to clinch the Democratic nomination for President, becoming the first woman at the top of the ticket of a major U.S. political party. Aftermath following the funeral of Freddie Gray on Monday, Apr. 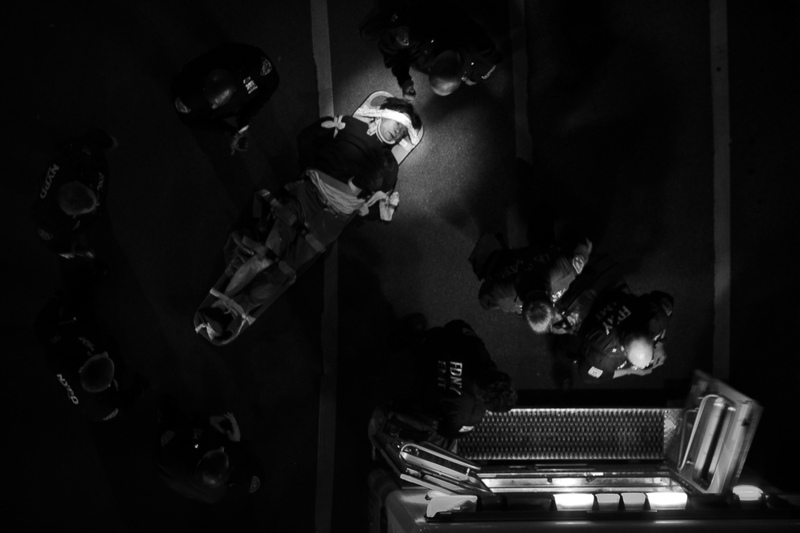 27, 2015 in Baltimore , M.D. Marie Tolley, 2nd from left, the wife of fallen New York City firefighter William Tolley, and her daughter Isabella, 8, react as his casket is loaded onto a fire truck during his funeral on April 27, 2017 in Bethpage, N.Y. Tolley, a member of Ladder 135 Engine 286 in Glendale, and a Bethpage native, was killed while battling a blaze in Ridgewood, Queens, on April 20. Two window washers were rescued from a scaffolding dangling 69 floors above lower Manhattan at 1 World Trade Center on Wednesday, Nov. 12, 2014 in New York, N.Y.
Angela Jewth holds her son Jonathan Jewth, 9, at the conclusion of his wake at the Thomas C. Montera, Inc. Funeral Home on Dec. 16, 2011, in the Bronx, N.Y. The fourth-grader choked after eating a meatball during lunch at Public School 47 in the Bronx. 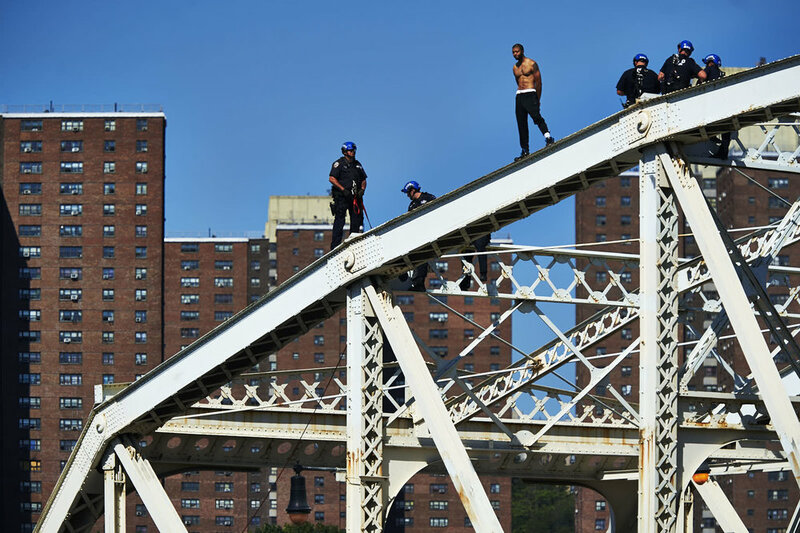 A Home Depot employee reacts after two men were shot dead at a Home Depot store on Sunday, January 25, 2015 in New York, N.Y.
Police officers speak to a man who climbed the Macombs Dam Bridge on Wednesday, September 14, 2016 in the Bronx, N.Y. The man was taken into custody and transported to a hospital for evaluation. Retired Port Authority Police Officer Henry Lallave pauses at a memorial for New York Police Department officers Rafael Ramos and Wenjian Liu on Monday, Dec. 22, 2014 in Brooklyn, N.Y. 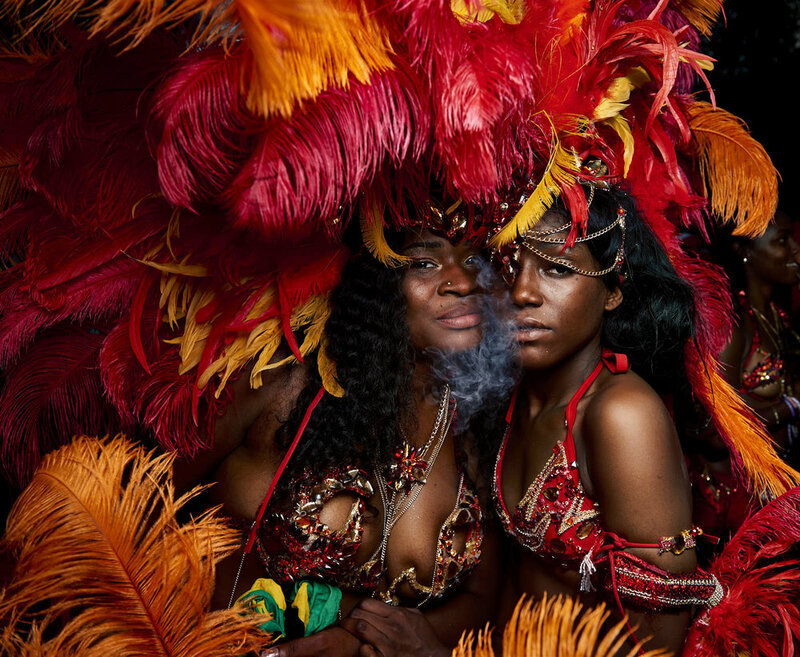 Participants of the West Indian Day Parade on Monday, September 5, 2016 in Brooklyn, N.Y.
Jean Dasilva, of Orlando, Fla., mourns the death of his friend Javier Jorge-Reyes, at a makeshift memorial at Dr. Phillips Center for the Performing Arts for victims of the Pulse nightclub mass shooting at on Tuesday, June 14, 2016 in Orlando, Fla.
Caren Menardy, of Harlem, NY cries outside the Apollo Theatre after hearing about the death of musician Prince on Thursday, April 21, 2016 in New York, N.Y. 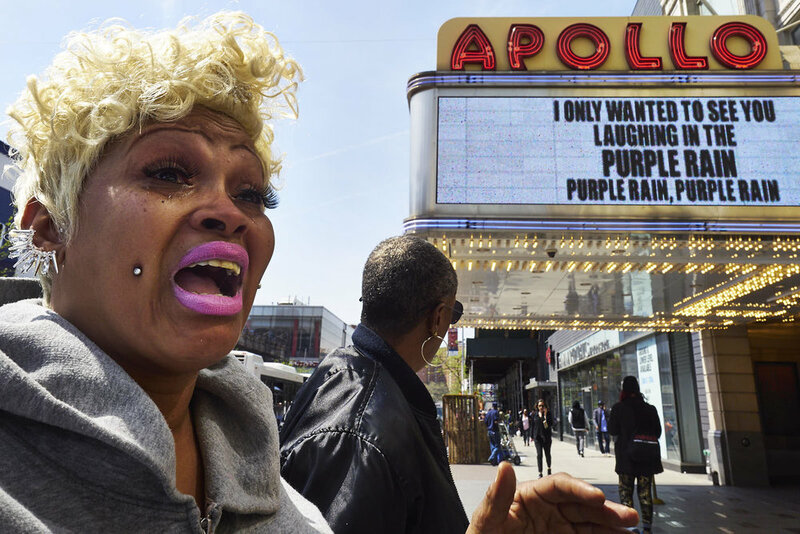 Prince, the multi-talented musical genius who emerged from Minneapolis with a unparalleled funk-rock sound that made him a global megastar, died suddenly at his home. 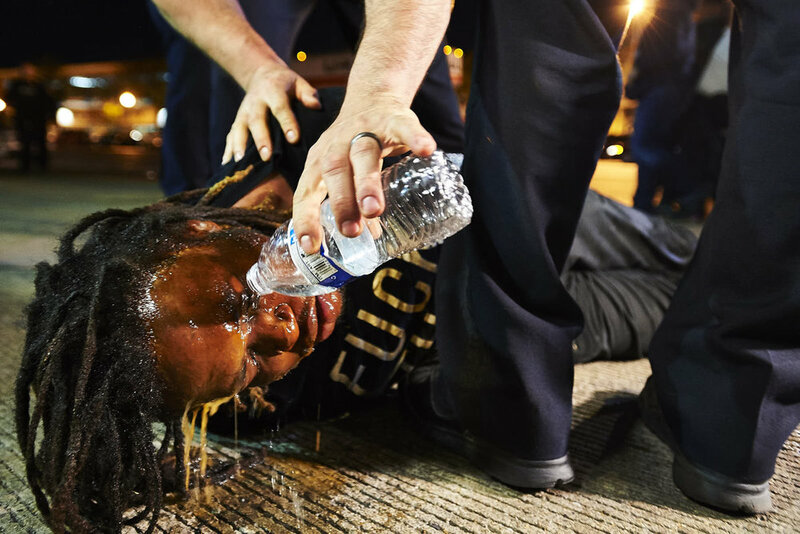 A protestor who confronted police officers after a curfew was pepper-sprayed and arrested on Saturday, May 2, 2015 in Baltimore, M.D. Baltimore authorities, in a swift and sudden show of legal might, charged six police officers yesterday in connection with the death of Freddie Gray, who died in police custody after he was arrested last month. A woman consoles a grieving protestor as demonstrations continued after the funeral of Freddie Gray on on Friday, May 1, 2015 in Baltimore, M.D. The Washington Square Park Arch is lit up with the colors of the French flag to honor the 130 victims of the Paris terrorist attacks on Nov. 15, 2015. Jennifer Pinckney, center, and her daughters, Eliana, left, and Malana, follow the casket of Sen. Clementa Pinckney as it is carried into the South Carolina Capitol building to lie in repose on June 24, 2015 in Columbia, S.C. Sen. Pinckney, a church pastor, and eight others were shot to death inside Mother Emanuel AME Church when gunman Dylann Roof opened fire during a Bible study session. New York Governor Andrew Cuomo comforts his mother, Matilda Cuomo, as pallbearers carry the casket of her husband, former New York governor Mario Cuomo, out of the Church of St. Ignatius Loyola during his funeral on Tuesday, Jan. 6, 2015 in New York, N.Y.
Family members and friends grieve by the casket of Tywanza Sanders during a burial service form Sanders and his aunt, Susie Jackson, at Emanuel AME Church Cemetery on Saturday, June 27, 2015 in Charleston, S.C. Sanders and Jackson were shot to death inside Mother Emanuel AME Church when gunman Dylann Roof opened fire during a Bible study session last week, killing nine. The casket of New York Police Department officer Rafael Ramos leaves Christ Tabernacle Church following his funeral on Saturday, Dec. 27, 2014 in Queens, N.Y.
New York Police Department visit a memorial for 84th precinct New York Police Department officers Rafael Ramos and Wenjian Liu on Monday, Dec. 22, 2014 in Brooklyn, N.Y.
Crime scene technicians examine the squad car in which New York Police Department officers Rafael Ramos and Wenjian Liu were shot and killed in by Ismaaiyl Brinsley fired in Brooklyn, N.Y., on Saturday, Dec. 20, 2014. A couple sits in Belmont Park after the 140th running of the Belmont Stakes in Elmont, NY. People mourn at a vigil for Islan Nettles at Jackie Robinson Park on Tuesday, Aug. 27, 2013 in New York, N.Y. Nettles was a transgender woman who was allegedly killed by Paris Wilson. Phillip Jackson Benson, right, reacts after knocking out Alexander Santana during a DiBella Entertainment - Broadway Boxing super middleweight bout at BB King Blues Club & Grill in New York, N.Y.
David Garvin lies dead on the sidewalk where he was killed after firing on six plainclothes police officers in New York, NY. Garvin killed a bartender and two auxiliary police officers. D.J. Pollard, 21, left, and Dori Levit, 20, of Boston, Mass., during a vigil at the Boston Commons for victims of the Boston Marathon bombings on Tuesday, Apr. 16, 2013 in Boston, Mass. People visit a makeshift memorial before attending Sunday Mass at St. Rose of Lima Roman Catholic Church in Newtown, Conn., on Dec. 16, 2012, after a mass murderer, killed his mother before opening fire on teachers and students inside the Sandy Hook Elementary School in Newtown, CT — a suburban town of just 27,000 people. Waddah Mubarz kneels by the body of his cousin Abubakar Saleh by Austin Place on Bruckner Blvd. on Sunday, Nov. 24, 2013 in Bronx, N.Y. Saleh was struck by another vehicle as he examined his disabled vehicle on the upper level of the Bruckner Expressway. A resident crosses a flooded street in Slidell, La., on August 30, 2012, after Hurricane Isaac touched down in Louisiana. People at the Stonewall Inn in the West Village react after New York's Senate approved a gay marriage bill on June 24, 2011 in New York. 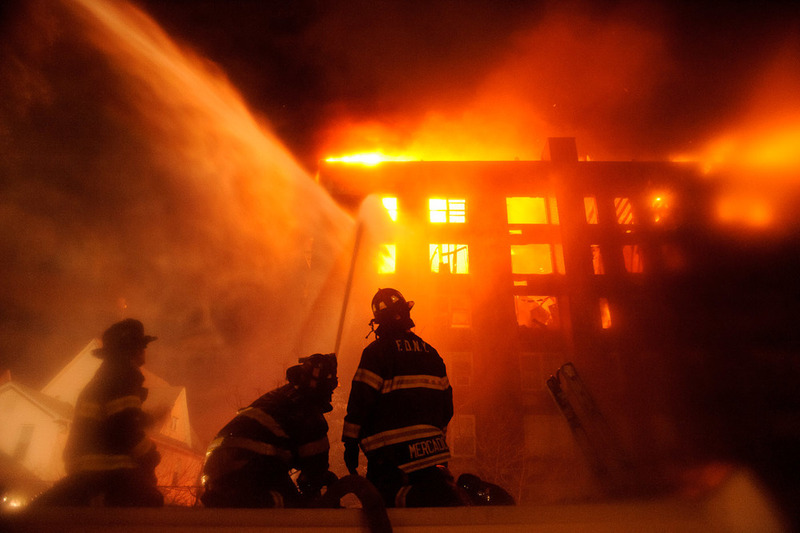 Residents view a 5-alarm fire at 550 E 180th St. in the Bronx, NY. Recovery efforts proceed at Ground Zero after the terrorist attacks of September 11, 2001. David Malone climbed the side of the New York Times Building early Wednesday morning and hung a banner over the first 'T' of The New York Times sign that featured a picture of terror kingpin Osama Bin Laden holding President Bush like a puppet. On it were the words 'Bin Laden's Plan' - the title of his book and Web site. Passengers are rescued off the Roosevelt Island tram after it experienced power failure. 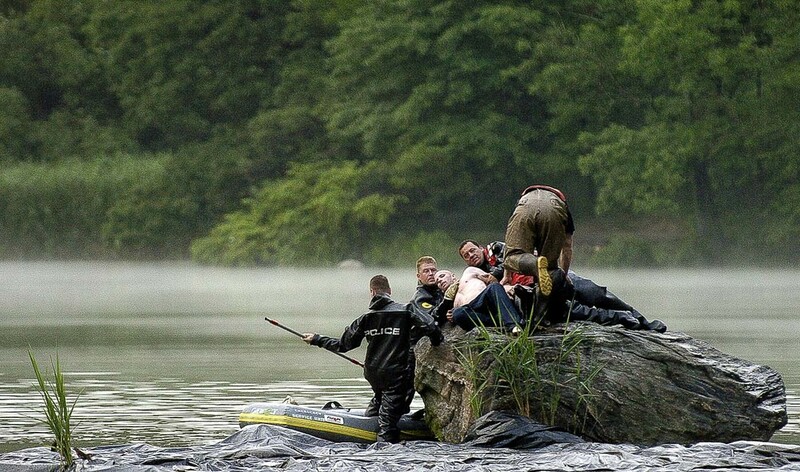 Emergency Service Unit members subdue an emotionally disturbed person who was standing on a rock in the Lake in Central Park.